These fund costume rings have genuine crystals on an elastic band and are Big and Blingy, but surprisingly comfortable. 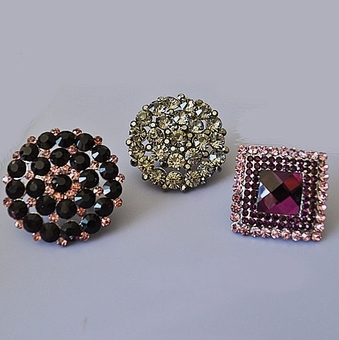 You have your choice of two Circles Around - one in Burgundy and one in Grey - which measures 2 inches across, and our Vintage Squared Burgundy and Rose Ring, which measures 1-1/2 inches across. I love the way they feel and the impact they have on my audience.